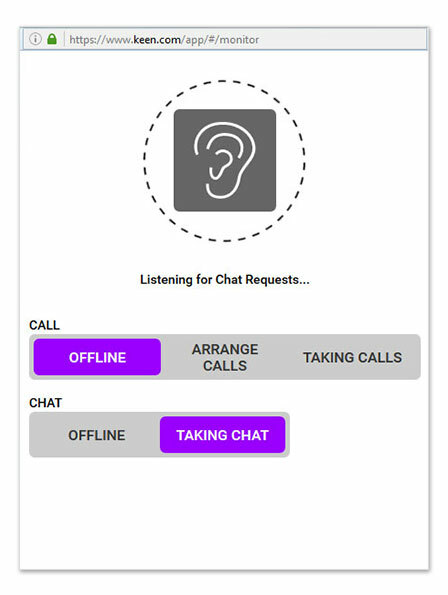 Keen chat is an instant messaging interface similar to other live communication applications used across the Internet. It allows real-time conversation between two Keen users. Once a chat has been initiated, either user can enter text, which will then appear on the other user's monitor. Are there rules and regulations related to using Keen chat? Yes indeed. Please review the Chat Policy. Are the payment policies different for chat? No. The rates for chat are the same as they are for calls. Learn more about the Payment Policy. What are the technical requirements for Keen chat? Keen uses your browser, and does not need any special software or downloads. Your browser (and any toolbars you may have enabled) must always allow pop-ups from Keen.com. Compatible browsers include: Internet Explorer v7 or higher; Firefox v2.5 or higher; Safari v5.0 or higher and Google Chrome v40.0 or higher. Will chat be compatible with dictation software like Dragon NaturallySpeaking? While we are not testing chat with dictation software and cannot offer any guarantees of compatibility, if your dictation software works well with your browser of choice, it should function with Keen chat, as our chat operates entirely within the website. Why is Keen chat still listed in beta? There is no predetermined duration for how long a product will be remain in beta. It will continue until it meets our usability standards. 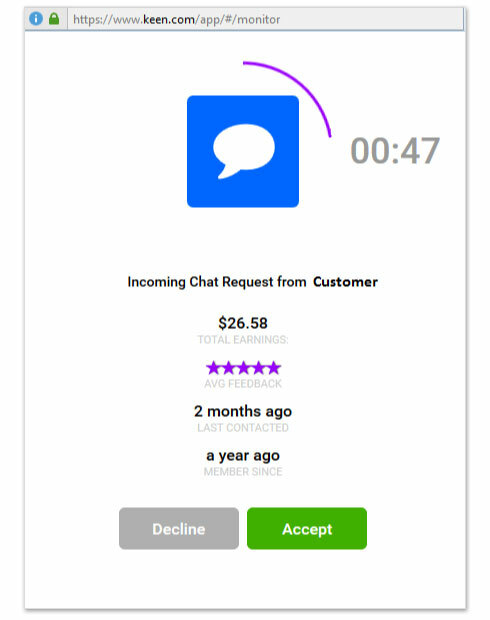 Can customers leave feedback for chat sessions? Yes. For more information how the rating system works, please visit the Feedback Help page. Can I use chat to communicate with customers in other languages, like Spanish, Japanese, etc.? The Keen chat system supports all languages as long as both you and the customer have the appropriate language packs installed on your computers. Can I initiate a chat with one of my customers? Sorry, only customers can initiate chat sessions. Can advisors chat with other advisors? Of course! If an advisor wants to initiate a paid chat session with another advisor they're able to do so. Is Keen chat compatible with SMS, AIM, Yahoo Messenger, MSN, ICQ, etc.? No. Keen chat is a proprietary system that's fully integrated with your Keen account and preserves the privacy of both the advisor and the customer. Therefore, it is not compatible with other instant messenger networks or client applications. Are advisors required to offer Keen chat? Advisors are able to offer chat entirely at their discretion. If you have no interest in offering the chat service, then you do not have to – it's an additional opportunity for you to sell your services, not a replacement of any other Keen service. Can customers get free minutes from Keen for chat sessions? Yes. Any new customer to Keen is eligible for the 3 Free Minutes offer. Customers can choose to redeem by chatting or calling you. What about advisor free minutes? Customers can use advisor free minutes for chat sessions or calls. It's up to them how they'd like to use them but they can only use those minutes once regardless of what medium (call or chat) they chose to consume them. How do I enable Keen chat? Log in to Keen and go to the My Keen page. Click the Edit link under "My Listings" for the listing on which you'd like to offer chat. Put a check in the box next to "Enable chat for this listing". Select the "Save" button at the top or bottom of the screen. Now chat is enabled on your listing! Does my listing need to be approved after I add chat to it? No. Adding chat to your listing will not require your listing to be reviewed again. How do I turn off chat if I no longer want to offer it? 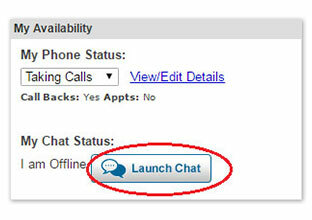 To make yourself unavailable to receive chat requests, simply do not click the Launch chat button. To completely remove chat from your listing, edit your listing and remove the check in the box next to "Enable chat for the listing". How do I set my chat availability to Online? 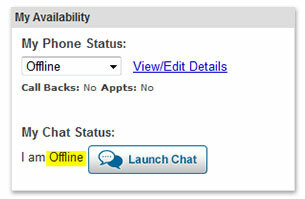 In the My Availability area, you'll see a new section called My Chat Status. Click the Launch Chat button. Now the "chat monitor" will open. You are ready to receive chat requests. 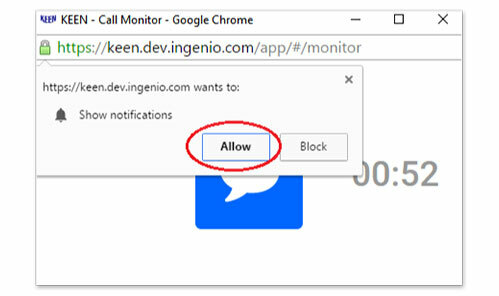 Remember, the chat monitor must remain open on your computer for your status to show as online and for you to receive chat requests. Can I take a call and still be available for free chat? No. Call and chat statuses are dependent on one another. If you're chatting with a customer your call status will show as busy and vice versa. Why does my chat button show "chat later" when I thought I was available? You chat status will display "chat later" if you are offline and do not have the chat monitor launched. The chat monitor window must remain open and active for "chat now" to display. How will I know I have a chat request? You'll be alerted in real-time when there is an incoming chat request. The alert should appear on your screen automatically, and will be accompanied with an audible sound. The details about this customer will be presented on the call/chat monitor. Click Accept to start the chat session with your customer. What happens if I decline a chat session? If you click the "decline" button when a chat request appears, you will remain logged into chat and the customer will be notified that you are no longer available. What happens if I miss a chat request? If you do not respond to a chat request within 60 seconds, it will automatically decline the session and log you out of chat. In addition, Keen will deduct 2 points from your listing points.